I understand the impulse. We often believe we’ve made more progress than we have as a society, and when we are confronted with stark and horrifying evidence that the reactionary right still has a strong foothold dragging us back toward a despicable past, it’s a bit of a shock. Progress is slow, and the currents that carry it forward ebb and flow. America has hit an ebb, and Nazis feel emboldened, and so they are in an active period. Things will likely get worse before they get better. I live in Athens, Ohio, and we’ve had letters to the editor recently about an uptick in seeing those flying the Nazi flag in southeast Ohio. Athens is one of Ohio’s most liberal cities. Another one is Yellow Springs, in western Ohio. The Mockingbird has a story from late last month about Nazis papering the village of Yellow Springs and Antioch College with fliers of bigotry. In the hour before dawn on August 28 a college student found the first flier while on their morning jog. It was wheat pasted to a stop sign. Every stop sign on their route had one or more flyers from two different neo-nazi groups. 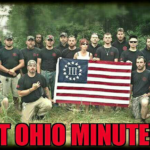 A few blocks away, a professor went for their morning coffee and noticed a pickup truck with prominent stickers for a so-called 3% militia group called the “West Ohio Minuteman” idling in a parking lot downtown. Heavily armed 3% militia groups have taken the task of protecting the “Free Speech” rights of neo-nazi groups and more mainstream official Trump rallies. This author has seen them armed, illegally, on Ohio Statehouse grounds chatting with police. This is the first time that a three percent militia has put up or openly endorsed neo-nazi propaganda. The Village of Yellow Springs, home of Antioch College, is a long standing bastion of civil rights. It was a stop on the underground railroad. It was the first municipality in the nation to include sexual orientation in it’s anti-discrimination ordinance. The list of other notable human rights milestones is much longer. The flyers, bearing the names of Identity Europa and the National Vanguard, were not aimed at recruitment. They bore no point of contact. There are zero people in the village of under 4000 souls that want anything to do with such a thing. All the flyers were had slogans supporting white supremacy or expressing hatred for gays and/or feminists. This was a mass armed act of intimidation directed at an entire zip code because of it’s demographics and identity. Both Identity Europa and National Vanguard were participants in the two days of neo-nazi violence in Charlottesville Virginia this month that left one person dead and 35 wounded. Up with this, we must not put. These wicked people are to be shamed, and marginalized, and forced back into the shadows, forced to submit to the reality that blind hatred and intolerance has no truck with Americans of honor and conscience.